Any of our interpreters can be access from most any phone but works most effectively with speakerphones. 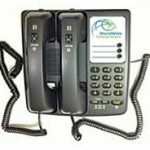 We provide phone equipment where a dedicated system can improve the use of, connection time, and has improved call quality. You have the option to order additional equipment and accessories that fit your organization’s needs. Note: Please be aware that this equipment is optional and not necessary for accessing our network of trained interpreters. (Optional) – The 2 Can Talk 2™ Telephone! Deluxe Euro Style 2 Handset Telephone Designed for Interpretation. Three (3) built-in “Memory Keys” designed with twin handsets the 2 Can Talk 2™ telephone ensures privacy during conference calls, in-house interpreting, or while using a language translation service. Each user has a separate handset for confidential communication. Built in CLEARING AID® circuitry automatically adjusts frequency response for improved clarity. This is an aid to 70% of Patients with high-frequency hearing loss. 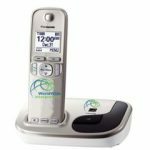 Designed with twin handsets the 2 Can Talk 2™ telephone ensures privacy during conference calls, in- house interpreting, or while using a language interpretation service. Each user has a separate handset for confidential communication. Perfect in Labor and Delivery Rooms to allow both parents to simultaneously be on the phone. ABS cabinet. Total Telephone weight 2.5lbs. Built in speakerphone with automatic differential balancing; >80 dB receive to transmit. Three Memory Buttons with Non-Volatile Permanent Memory. No Battery Needed. Two Headset Connections with Separate Volume Controls. 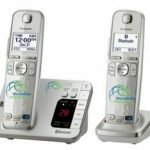 (Optional) – The cordless WorldWide Interpreters Phone is designed for situations where the flexibility of hands-free communication is more suitable for the customer/patient care process. This phone is a portable interpretation device designed to travel with you to your patient or client. 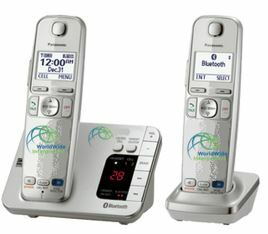 It offers simple OneTouch™ dialing and digital duplex for bi-directional communications between you and the interpreter. Dedicated Interpreter – No dial pad; our surveys with the medical community found that normal dialing capability leads to potential misuse. Eliminates dialing mistakes – No phone numbers to remember or stored numbers to mistakenly delete. Eliminates use of interpretation devices for personal use – Interpretation devices cannot be used by staff personnel for personal use or long-distance. Deters theft – Who wants a phone with no dial pad? One-Touch™ –Physician Proof; no phone number to memorize or clumsy button sequence to recall. (Optional) – Enjoy the convenience of having two interpretation devices operating from one base station. This dual-handset system operates with only one phone jack, but allows multiple handsets to be located throughout the facility for greater coverage. Furthermore, by using two handsets in normal handheld modes, one each for the Health Care Provider and the patient or client, both parties can communicate with the interpreter for conversations that are more private or in high-noise areas. 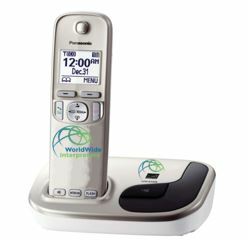 Each handset is a portable interpretation device designed to travel with you to your patient or client. It offers simple OneTouch™ dialing, digital duplex for bi-directional communications between you and the interpreter. Note: Purchase of phone system(s) is reserved for current WorldWide Interpreters customers as we do not provide phone equipment to the public. Dual handset phone. Compatible with virtually any IP PBX that allows SIP connections. Certified by Avaya and Cisco. Both LAN (Local Area Network) and WAN (Wide Area Network) ports. Power Over Ethernet (POE): phone works without AC power. The twin handsets ensure privacy during conference calls, in-house interpreting, or during a language interpretation session. Each user has a separate handset for confidential communication. 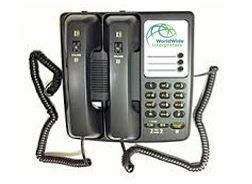 A wireless phone that you can take with you with the same interpreter access as a corded phone. A dual-handset wireless phone that can increase confidentiality and sound quality as each person can hold a handset. Where Will We Ship Your Support Materials?